You might say that this post is “childish”, but that is exactly what I am aiming for. (A note to readers outside Canada: this post contains cultural references which are likely more familiar to Anglophone Canadians than to people outside Canada). My last post on the small Francophone town of Debden, in northern Saskatchewan, was no accident. In this post you will see why. For those of you who grew up in Canada’s Anglophone experience, as children (from the time of birth to the age of perhaps 10 or 12), you were surrounded in a world of “Canadian pop-culture for children”. It didn’t matter which of the 10 provinces or 3 territories you lived in – the experience was very much the same for children across the country (which is an amazing feat considering the distances involved). Of course, different ages had different pop-cultural references(toys, programs, and songs for a three year old toddler would be different than for a child 8 years of age). But the experiences were generally the same for children who grew up in the same age bracket as you. We can group such references from three different angles. (1) International children’s culture shared by children across borders (the Smurfs are Belgian, Paddington Bear is British, Fraggle Rock was a tri-way British/American/Canadian produced program, Snow White is American, etc). (3) And then there is localized children’s culture. I can offer you some of examples. I remember as a young child playing with toy logging equipment when I lived in Northern B.C. (Yup! Toy logging trucks and toy chain saws as I imitated what I saw around me in Terrace, BC). Later, when I grew up on the Prairies, I recall I used to love to play with toy farm sets. Around age 8, I would play for hours with my toy tractors and animals, imitating what I saw on the farms around the areas we lived. (As an adult, I play with motorbikes… but they ain’t toys – hahaha — but on second thought, I suppose they are!). I have friends from the Atlantic Provinces who tell me they played with “fishing” toys as children, such as toy fishing boats, nets, and toy lobster cages (It makes me wonder what toys kids in the far Arctic play with). But have you ever wondered what children’s pop-culture might be like for children in Québec? Many of the references I provided above are “English-language” references. Yet for Francophone children in Québec, many of the children’s pop-culture references at a “national level” are different from those of Anglophone Canadians. In Québec there was no Polk-a-Dot Door, no Mr. Rogers, no The Friendly giant, no Sharon, Louis, and Bram. Over the years, when people in Québec have found out I have family roots in Saskatchewan going back generations, what do you think one of their first reactions and comments to me were? Come on, what do you think it might be? Boy, if I had a dollar for every time I heard that statement in Québec… !! Bet 1: If you’re Anglophone Canadian, you likely have no idea who Carmen Campagne is. Do you know who Carmen Campagne is? If you do not, that means that many cultural aspects of the Two Solitudes remain alive and well (as you can see). Bet 2: I would venture to say that most people who grew up in Québec, and who are anywhere from 0 to 50 years of age knows who she is (they have either grown up listening her, or have had children who have grown up listening to her). Likely there are hundreds and hundreds of thousands (if not millions) of Québécois whose first thoughts turn to Carmen Campagne when they think of Saskatchewan. In fact, because there are so many Québecois who may know who she is, it is quite possible that in terms of real numbers alone, Carmen Campagne could be one of the most well-known Saskatchewanites outside Saskatchewan (and possibly in the world). Carmen Campagne is a French language children’s singer & entertainer. Perhaps the closest Anglophone Canadian equivalent would be Raffi, or the singers from the group Sharon, Louis and Bram. Now you can see why I wrote yesterday’s post on Debden, Saskatchewan. She is a Fransaskoise (a Saskatchewan Francophone) children’s singer and quite famous in Québec and all across French Canada. 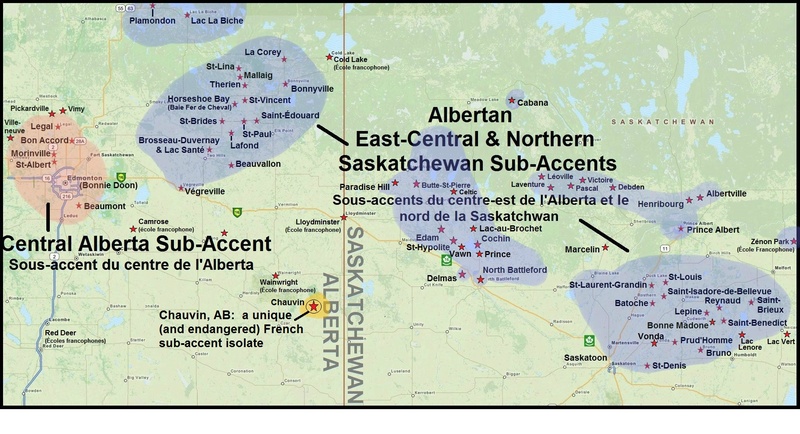 (BELOW is a map of the French sub-accent zone in Southern Saskatchewan which encompasses Willow-Bunch). For Francophone children in Québec, she is part of their childhood memories. The songs she sings are part of Québec’s children’s references when growing up. This is not only an example of Québec’s own culture for children, but it also serves to show how Canada’s overall Francophone society is tied together (across provincial lines). Children’s culture, for any society, eventually becomes part of our adult culture. It is what makes a society unique, and reinforces societal bonds of having “grown up together”, and “experienced the world as one”. It’s interesting, and it is something I feel more Anglophone Canadians should be aware of. Radio Canada International (RCI) is Canada’s public “international broadcaster”. It’s sort of a smaller version of Canada’s equivalent of BBC International or Radio France International (RFI). It falls under the umbrella of CBC – Radio-Canada, but it does not broadcast within Canada. Rather it broadcasts to all corners of the globe. It seeks to tell Canada’s story to the world. This also includes many stories pertaining to Québec and Canada’s overall Francophone nature. 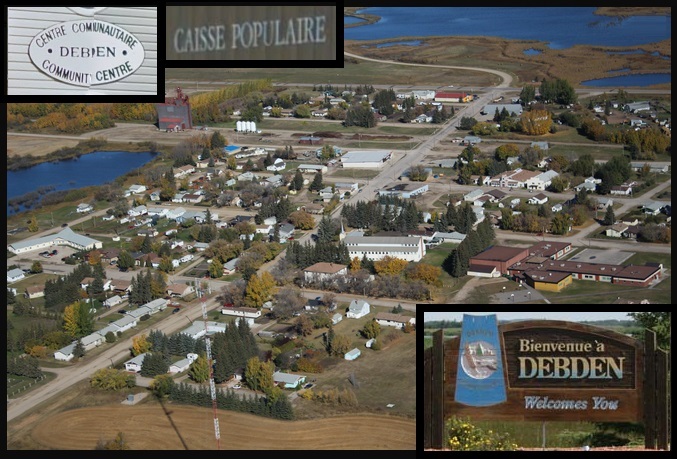 Here is one such story… The story of the Francophone village of “Debden“, North of Prince Albert in Northern Saskatchewan. 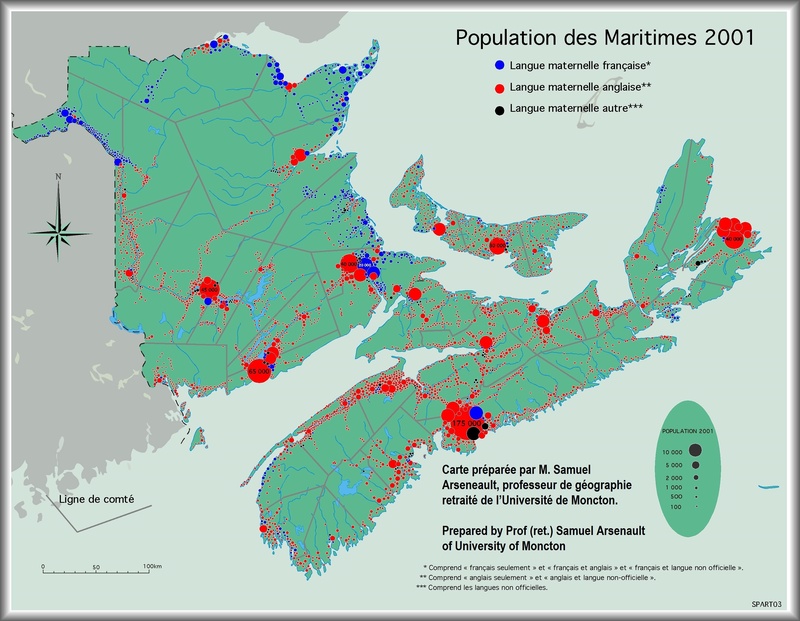 I’m providing this report to you because Canada’s Francophone communities outside of Québec often share many cultural traits and realities with communities within Québec – which, together, weave Canada’s overall Francophone nature into one pattern from coast-to-coast. If you are working to improve your French, the following report is spoken in international, standardized French, albeit with our own homegrown accent. The speed and accent in the report should be relatively conducive for language learners (one of the main reasons I chose to present you with this particular report). As an aside, I added a little bit of information about Debden and its particular French accent in the post on Prairie & Western Canada French Accents (click the link). Almost a year ago, I wrote a post entitled Country music = Québec. In that post, I explained how Québec’s music roots have always been connected to a genre of French-language country music. A couple of people I know (who are from Montréal) said I was nuts when I wrote that post. They told me nobody listens to (French) country music (or any country music). My response: “Perhaps you’re right if you live downtown Montréal, and if you base your entire life around downtown Montréal”. I told them to just wait for a few months, perhaps a year or so. I told them with the uptick in French-language country singers and it’s resonance / ties with traditional French Canadian music, that I would bet my bottom dollar that we’d see a virtually unknown French-language country artist come to the fore and top the album charts in Québec. Well… the writing was on the wall — and guess what! It just happened! there can often be a HUGE disconnect between our largest cities and all the rest. You get the sense that this disconnect becomes as wide as the Pacific when it comes to lifestyles and concerns lived by people who reside in the downtown cores of our larger cities, and all the rest (even the suburbs for that matter). As usual, the rest of Québec, and the rest of Canada do not all live in downtown Montréal, Toronto, or Vancouver (on that note, one federal party leader in particular better learn this little factoid very fast, or his party will be heading straight down the tubes in October – ok, ok… no more political commentaries, I’ll behave now). This post will make my point, and will emphasize just how wide that gulf can be (between the city – particularly the city cores — and all the rest). Guylaine Tanguay is a French-language country singer, from the Saguenay region in Québec – particularly from Dolbeau (I actually wrote a post on her hometown last winter, which you can read by clicking HERE… (Boy… even I am surprised that I wrote a post on Dolbeau! I guess I have covered some territory with his blog after all). Her new album, Inspiration, was one of the best-selling albums in Québec of the entire summer! Yet, ask someone in Montréal (particularly downtown Montréal), or downtown Québec City, or downtown Ottawa (which I consider within the “Québec urban sphere of influence”) who she is, and you’ll just get blank stares. But go elsewhere, such as the smaller cities around the province, and you’ll find a good deal of people who know who she is (you don’t even have to go very far… sometimes just as far as the suburbs such as St-Eustache, Gatineau, or Beauport). All Tanguay has done was a little advertising on television, given a few concerts, and the crowds AND SALES came’a flock’in! Province-wide, her album has even bumped out the “Clique’s Montréal’s downtown darlings”, such as Jean Leloup and Yoan, from the top spots. This little whirlwind named Guylaine Tanguay has the (sometimes quite stuffy) “downtown Montréal cultural class” (informally known as the “Clique du Plateau”) scratching their heads in disbelief (and me shaking my head at their disconnect from the rest of the province). I actually wrote a post on the Clique du Plateau way back when (click the link). Whether or not you think a true media Clique exists (ie: media which all beats the same drum in central Montréal), is a question of debate, impressions, and person viewpoints. Regardless of my own viewpoints, it’s not for me to categorically say if it does or doesn’t exist (there are people with opinions all over the place, and grey comes in all shades). However, if the Clique were to describe a general “downtown attitude” in any big city, then you could perhaps say it’s a snobby attitude, in the sense that if related media feels “their own” media circles were not the ones to launch or promote someone’s career, or if “they” were not the ones to invite an artist to their TV or downtown radio programs, then it the music must be crap (sigh x 10). Guylaine Tanguay is one person who could be said to have proved them wrong – and in no small way. Here is an article by a “shocked” and baffled Radio-Canada (hahaha!! Love it!!!) — Click HERE. Here is an article by the Courier de Laval (from the suburbs of Montréal, so it comes with less shock and horror than articles written from downtown Montréal – hahaha!!!). Click HERE.